Describes what it means to be anointed with the Spirit so that one can preach "to raise the dead." In The Holy Spirit and Preaching, James A. Forbes, Jr.--widely hailed as one of the nation's foremost preachers--offers four dynamic lectures originally delivered as the Lyman Beecher Lectures at Yale University, the most prestigious annual preaching event in the United States. In each of the lectures, Forbes focuses on the Holy Spirit as it relates to preaching. He traces the Holy Spirit's activity in Jesus' ministry and looks at the impact of being anointed by the Holy Spirit. Forbes demonstrates how the Holy Spirit works with the pastor in the preparation and delivery of a sermon. The Holy Spirit and Preaching concludes by focusing on the need for anointed preaching, and the way anointed preaching happens today. 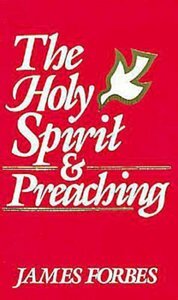 About "The Holy Spirit & Preaching"